Kansas Cyclist is the web's premier resource for cycling in the great state of Kansas. Though not blessed with flashy features such as mountains or oceans, Kansas does offer subtle beauty to those who can appreciate the surprising diversity of landscapes and terrain within its borders. As well as great natural beauty, Kansas offers countless miles of roads and trails, for both on-road and off-road cycling. And contrary to popular opinion, Kansas is not entirely flat, with its share of hills, rivers, and valleys. To learn more, explore our comprehensive collection of Kansas cycling resources, and be sure to check out the calendar of coming events. An updated 2019 version of the Kansas Rails-to-Trails Map documents continued progress of the ever-growing trail network in Kansas. With the recent approval of the ABC Trails Plan, Allen, Bourbon, and Crawford counties have become the first rural Kansas counties to collaborate on an active transportation plan. Biking Across Kansas, the annual week-long supported tour across the Sunflower State, has announced their 2018 route, which crosses the southern tier of the state, June 9-16, 2018. 04-27-2019 Open Range Gravel Race - A gravel road race through the scenic and rugged Gypsum Hills of Kansas. 100k and 200k distance options. 04-28-2019 Lone Star Century - An annual ride organized by the Kansas City Metro Bicycle Club, beginning and ending in Gardner, and running past Clinton and Lone Star Lakes south of Lawrence. 28, 45, 64 or 100 mile options. 04-28-2019 Cool Hand Luke Gravel Grinder - An epic bicycle event through the countryside of Leavenworth County, Kansas. 25, 62 and 100-mile route options. 05-03-2019 La Grind - La Grind is a three day supported gravel stage race in Emporia, Kansas. 05-04-2019 Rural Route 13.1 - An annual event in Esbon, KS, featuring a 13.1 mile bike ride, as well as a walk/run event. 05-05-2019 Sand Plum Bicycle Classic - The Sand Plum Bicycle Classic offers 13-mile, 28-mile, or 50-mile routes through Reno County, Kansas. This is not a race, but a fun ride for all to enjoy. 05-11-2019 Gravel Ride for Maisie's Pride - A fund raiser for the community pool in Eskridge, KS (Maisie's Pool), with about many scenic and challenging miles of Flint Hills gravel to enjoy. 05-18-2019 Elrod's Cirque - A gravel grinder set in the southern Flint Hills of Kansas, starting and ending in downtown Winfield, with 16, 61, and 121 mile route options. Part of the Boneshaker Gravel Series. 05-19-2019 Wicked Wind 100k - The Wicked Wind 100, in early May, welcomes riders of all abilities for rides southwest of Wichita. 05-25-2019 Cottonwood 200 - A 200-mile, three-day bicycle tour through the Flint Hills of northeast Kansas, covering some of the best cycling terrain in the state, and using some of the same paths used by Native Americans, settlers, and cattle drives. 05-31-2019 Kandango - A four-day bicycle tour on the back roads in Kansas, through the Smoky and Flint Hills. 06-01-2019 Dirty Kanza 200 - The ultimate gravel grinder, the Dirty Kanza is an extremely challenging ultra-distance bicycling marathon event, starting and ending in Emporia, Kansas and covering 200 miles of blacktop, gravel, and dirt roads through the scenic Flint Hills. 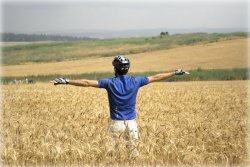 06-08-2019 Biking Across Kansas - Biking Across Kansas (BAK) is a recreational bicycle tour that crosses the state of Kansas within the space of eight days. Participants enjoy the challenge, camaraderie, and adventure of pedaling from Colorado to Missouri under their own power. 06-15-2019 Mound City Meander - Gravel road ride out of Mound City, Kansas. 06-30-2019 Cider Mill Century - Tour the beautiful countryside of Miami and Linn Counties, starting and ending at the Louisburg Cider Mill. 25, 57, 75, and 104-mile routes. 07-04-2019 Sterling Old Fashioned 4th of July Bike Ride - Celebrate Independence Day with a 20-mile bike ride in Sterling, Kansas. 07-14-2019 Heather's Ride - A Goddard, Kansas event offering 25, 50, and 75-mile routes through scenic south-central Kansas. The ride benefits the children of Heather's Camp for vision-impaired and blind youth. 07-20-2019 Tour de Cure: Wichita - A one-day fundraising cycling event to benefit the American Diabetes Association, starting and ending in Wichita, Kansas.